We all have our different tastes when it comes to interior decoration. Trends come and go and what is classed as unique may suddenly become mass market. However, I think your interior design is another expression of you and your family. Your home is your castle, and you want to make each room work for you. Sometimes sticking with something a little more classic can have a huge impact, and certainly, stand the test of time. One thing I think more thought should be given to is seating and chairs. They can be a huge focal point in any room, from the dining and living areas through to the master bedroom. Antique furniture has a story, and often the pieces you come across will be unique. Mixing classic interiors with modern touches can be a great way to transform any room. 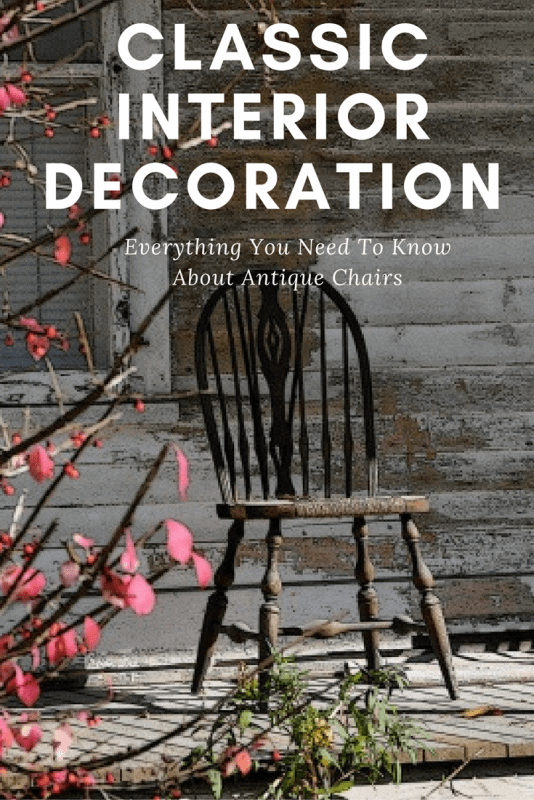 With that in mind, I thought I would share with you everything you will need to know about finding antique chairs. I hope it inspires you to step out of the modern interior bubble we are in furnish your home to your specific tastes. Finding a chair, or even a set of chairs, that look antique can be exciting. But unfortunately, there are so many imitations out there. This is when you need to sure you can identify whether what you have or want to purchase are antique. A great indicator is to identify if there is a maker mark anywhere on the piece. Then head to trusty Google to see what it brings up. If you are unsure, then it might be worth paying for an expert opinion. But often through a lot of internet research you should be able to identify what is a real and what may be a very good imitation. You won’t be on your own if you assume any old piece of a furniture is antique. But there is quite a bit of difference between what is just old, and what can be classed as an antique piece of furniture. Some antique specialists will have an antique age of around 50n years or older, whereas some will say that needs to be 150 years. One of the easiest ways to identify antiques is through its joinery. A lot of the mass produced furniture we see, which still may look old, could have been created with a machine. Machine cut furniture wasn’t around until after the year 1860. So bear that in mind when looking. You may also want to pay close attention to the symmetry of the piece and also the arches. In some refined pieces, you may be able to still see evidence on how that particular piece of wood was cut. Thankfully, with the internet today, you can do a lot of research and even buy online. Gone are the days where you will hunt round car boot sales in the hope of finding a treasure. Places like antiques world have many different choices, and it provides you peace of mind that what you are buying is genuine. Don’t forget, a chair, a set, or even bigger pieces like sofas and benches can transform a room. Your dining room could be a real talking point with a set of six antique chairs. Such as your bedroom with a one-off chair for your dressing table. Be quirky with your choices. Remember if you like it, then it should work well with your interior design. I hope this has made you a little more informed about antique purchases and inspired you to look into it yourself.